278 pages. 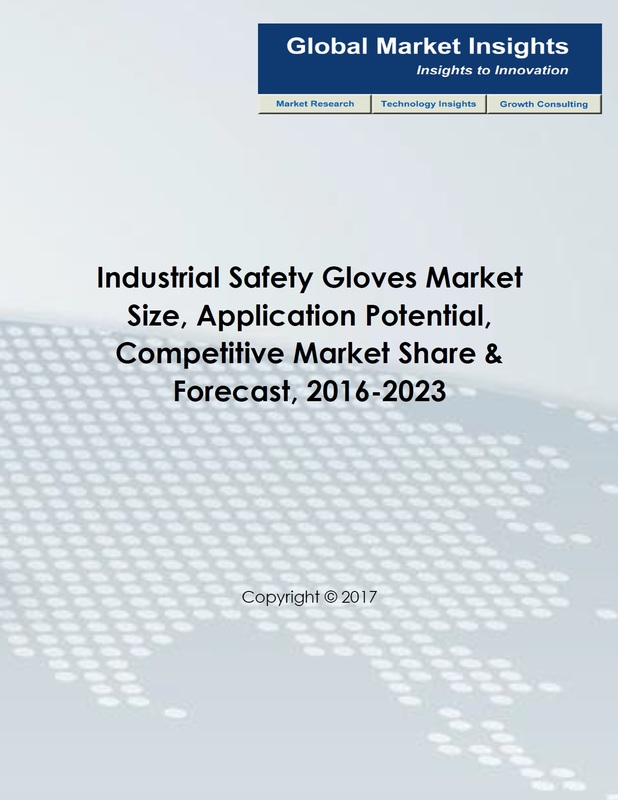 Industrial Safety Gloves Market Size By Material (Nitrile Gloves, Natural Rubber Gloves, Vinyl Gloves, Neoprene Gloves, Polyethylene Gloves), By Product (Reusable Gloves [Supported Knitted, Knitted, Dipped], Disposable Gloves [Disposable Thin Mill, Cut Gloves. General Purpose Gloves, Chemical Gloves]), By Application (Reusable Gloves [Machinery, Automotive, Metal Fabrication, Oil & Gas, Chemical, Construction, Food Processing, Aviation, Healthcare], Disposable Gloves [Aerospace, Food Processing, Flat Panels, Medical Devices, Pharmaceuticals, Semiconductors]), Industry Analysis Report, Regional Outlook (U.S., Canada, Germany, UK, France, Italy, Russia, Poland, China, India, Japan, South Korea, Indonesia, Malaysia, Thailand, Brazil, Mexico, South Africa, Saudi Arabia, UAE), Growth Potential, Price Trend, Competitive Market Share & Forecast, 2016 – 2023.